Compare this catch with beats such as Dalguise or Dalmarnock on the Tay. Blazing sun and more news on tagged fish. We were surprised and delighted when our New Zealand visitor, Roger Findlay from Christchurch, caught and returned a small salmon (possibly an early grilse) in the head stream of Tyndals. The fish was caught in briiliant sunshine in the middle of the day with only 4″ on the SEPA level guage at Gella Bridge. Roger’s catch ensured that we did not have our first blank week since late March and brought the FCW salmon catch to 20 for the 2012 season to date. Well done Roger! An advantage of having the Haughs pipe bridge, which we call the ‘Aqueduct’, crossing the river at the head of Haughs Pool is that it is easy to see fish lying in the head stream of the pool. A small shoal of rather small sea trout is currently positioned just below the aqueduct and there are some salmon lying further back in the pool, some of which are showing signs of disease. There are also good numbers of fish in Red Brae and Tyndals. Fish have also been seen in Indies (See Derek’s report below) and in the main pools of Bogardo Beat downstream at Tollmuir and Marcus House Pools. The gathering of fish in the stream into Tyndals is particularly impressive, with a few sea trout in amongst the salmon. This is Tollmuir Pool from the right bank in summer conditions. This is one of FCW’s deeper pools, with the main dub about 12′ 0″ and a beautiful 25 yard stream into the pool and a long hourglass shaped glide out of it. Where the ‘waist’ is pinched is the main lie in high water. This is a special pool, close to the old toll gate on the main road north, but it is generally under fished because of the effort required to cross the island known as ‘Merrinwood’ in order to fish the pool effectively from the right bank. You could spend a whole night on this pool at sea trout time! Report on the MSS radio-tagging project. 16 salmon were tagged last week, which brings the total number of tagged fish since February to 141. We are now just 9 fish short of the 150 target to 31 May. An impressive achievement by our dedicated team of scientists. 3 new fish have been reported, one in the South Esk and 2 in the North Esk. There are no reports of new fish in either Dee or Tay. 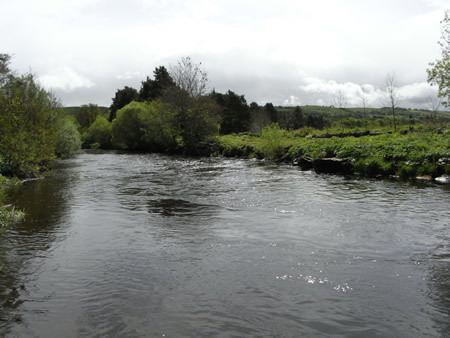 There has been some movement in the South Esk, with fish now up to Justinhaugh and at least one fish at Finavon. Posted in Fishing Report, River Report, Salmon | Comments Off on Blazing sun and more news on tagged fish. News from the radio tagging project is that there are three new fish recorded, one for the South Esk, one for the North Esk and one for the Tay. The total fish tagged last week was 12, bringing the total tagged since February to 125, and the number subsequently recorded to 27 (21.6%). There has been some movement of tagged salmon within the South Esk, with fish moving from Bridge of Dun upriver towards Brechin. 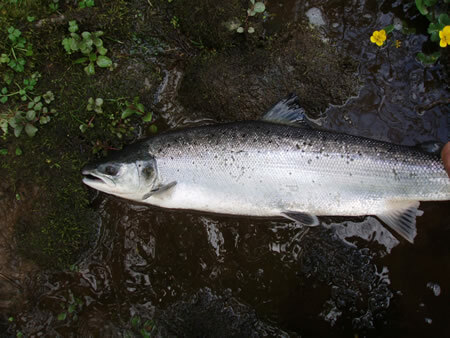 I think it is fair to suggest at this late stage in May that the spring run in 2012 appears to be less numerous than in 2011, but that the condition of these early running MSW salmon has been generally excellent. Therefore it may be reasonable to claim that some, perhaps even a majority, of spring salmon are getting access to good feeding at sea. The attrition of numbers of returning adult fish therefore is not simply a lack of food. There are clearly other factors at work, and it is on these unknown aspects of the salmon’s life that ocean pelagic surveys need to gather more data. FCW caught and returned three more silver salmon (to 11lbs) last week, of which one was sea liced. This sea liced salmon of 9lbs was caught and returned in Tyndals Pool (Milton Beat) on a bitterly cold evening on 19 May. In a year of rather disappointing numbers of salmon caught, the condition of this fish was normal for MSW salmon caught in the first three months of the season.